Grab your sneakers! Our annual Chubby Cat promotion is back! We’re offering a $1 per pound discount on cats one year and up to encourage animal lovers to welcome a furry workout buddy into their hearts and homes. If you have a chubby cat at home, or are thinking of adopting one, check out our tips to transform your kitty’s life*! First and Foremost, See a Veterinarian. While you can get advice from us and other online resources, the best advice will come from your vet. During a check-up, your vet will dig into your cat’s medical history, analyze their body condition score (pictured below), and inform you of what their ideal weight should be. 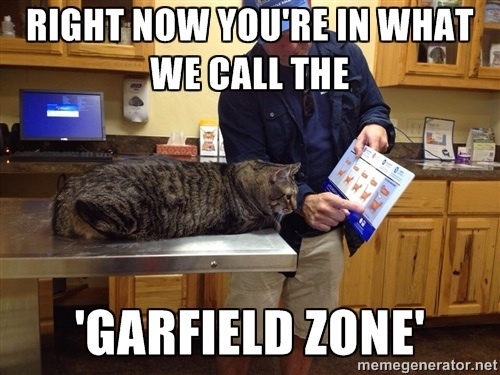 Your vet will also be able to identify and treat any underlying medical condition that may be contributing to your cat’s weight gain. If the vet determines that your cat needs to lose weight, they will recommend the best plan of action for gradual weight loss. Vets will be able to give you a customized plan since they have a special formula to determine your cat’s daily calorie needs. Don’t Take Excess Weight too Lightly! To us humans, 2lbs is like a drop in the ocean. But to felines, 2lbs in excess weight means an increase of around 20% body fat! 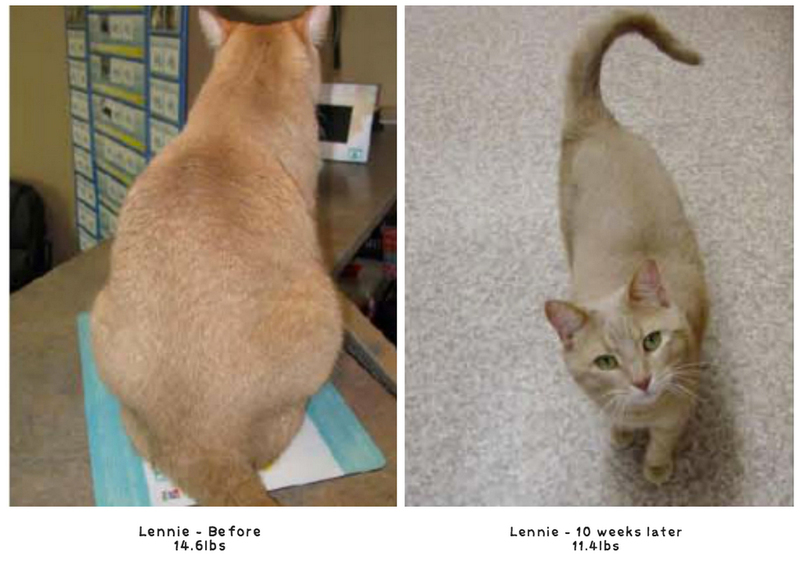 Check out the difference in Lennie after only a 3lbs weight loss (pictured below). Feed your Cat Biologically Appropriate Food. 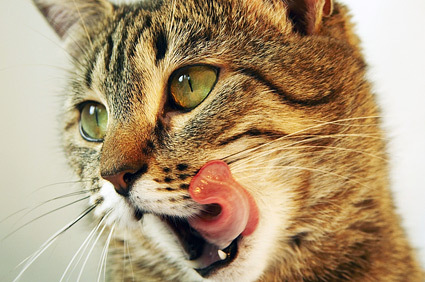 Unlike humans, cats cannot thrive off a grain-rich diet. Cats are biologically carnivorous – their health depends on a protein heavy diet. Cats are also historically desert animals and in the wild, derive hydration from the meat they consume. 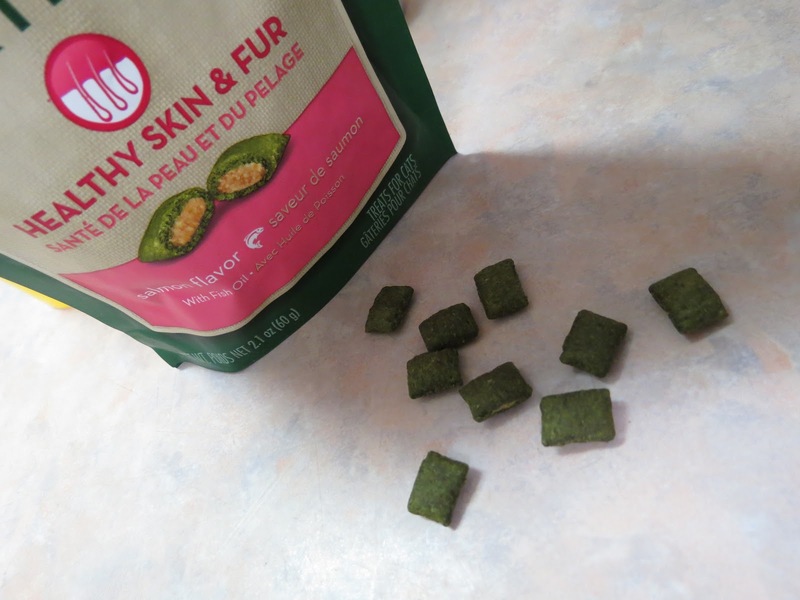 Taking this information into account, a 100% dry food diet for cats is not ideal. Dry foods tend be to higher in carbohydrates and can harm feline kidney function since they are not receiving any water content. Studies have shown that transitioning overweight cats from dry food to canned/wet/raw food has significant benefits on their weight and renal function. If your budget doesn’t allow for a 100% canned-food diet, don’t feel guilty or bad! The same study showed that even introducing canned-food to 25-50% of your cat’s diet has major benefits. If wet food is completely out of the budget, then you should select limited calorie dry food that lists meat as the first 2-3 ingredients. Check the back of the packaging for complete ingredient info. As shown above, most grocery store cat food brands advertised as “meaty” or protein-heavy contain corn and grain as fillers. This is not a biologically appropriate food choice for cats. Divide Daily Intake into Several Feedings. As you reduce your cat’s daily calorie consumption, some cats get bothered and ravenous. You can help your cat with their transition by feeding them 3-6 times per day. But this is not a license to free-feed! Instead, you should simply divide their daily needs by number of feedings. For example, if your vet recommends 8oz of food per day, then feed your hungry kitty 2oz servings four times daily. For extra gluttonous cats, ask your vet about supplementing pumpkin puree in their foods as low-calorie way to help satiate their tummies. Once your vet makes a daily calorie recommendation for your cat, be sure that treats aren’t accounting for more than 10% of that daily need. Treats offer cats little to no nutritional value. It’s also a good idea to know the treat’s ingredients. Just like their food, feline treats should be extremely low in carbohydrates and high in . Some great treats are freeze dried chicken, liver, and bonito flakes. Exercising cats are not only crucial to their physical health, but it also serves as a crucial way to keep cats mentally stimulated. Bored cats tend to overeat! Use a cat wand, laser, or balls to get your cat moving and jumping! Play with them for at least 20-30 minutes daily. 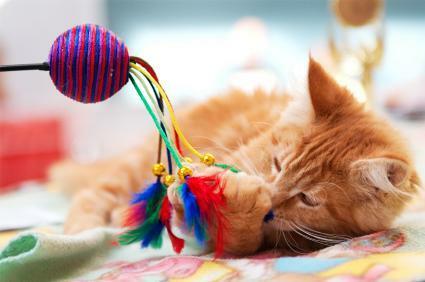 If your cat isn’t used to playtime, then you might have to experiment a few times before finding that perfect toy. But don’t be discouraged, most pet stores are gracious about allowing exchanges or returns. 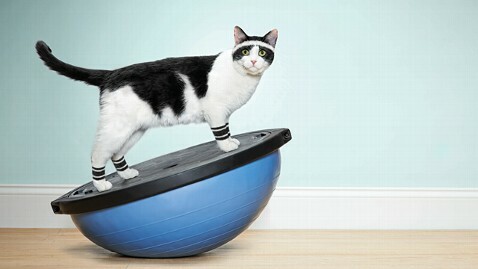 Sneakily arm your home with irresistible activities, so that your cat is exercising in your absence! 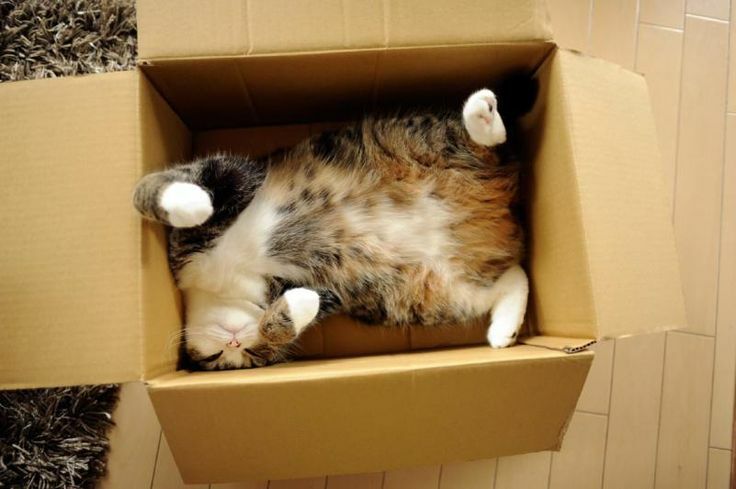 Leave cardboard boxes sprinkled with catnip, and your cat will be working up a sweat in no time. For laser-lovers, try an automatic cat laser teaser. It is equipped with a timer and can be set to entertain your cat in your absence. Providing your cat with vertical spaces is also another way to sneakily keep them active. Since cats naturally prefer tall spaces, they will be forced to climb and jump as they roam your home. Entice cats to explore their vertical spaces by attaching toys and sprinkling catnip! *While our tips are well-researched, it is not a substitute for veterinary help. If you suspect that your cat is overweight, consult your veterinarian asap.